CONTENT In recent years, Cambodian garment workers have often launched extensive, coordinated strikes to demand higher minimum wages and other political concessions. In China, on the contrary, most protests in the garment sector target specific employers and remain contained inside single factories or industrial zones. How to explain these different patterns of labour activism? 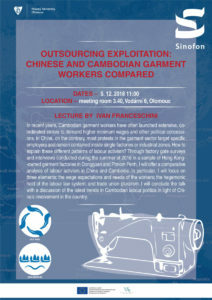 Through factory gate surveys and interviews conducted during the summer of 2016 in a sample of Hong Kong-owned garment factories in Dongguan and Phnom Penh, I will offer a comparative analysis of labour activism in China and Cambodia. In particular, I will focus on three elements: the wage expectations and needs of the workers; the hegemonic hold of the labour law system; and trade union pluralism. I will conclude the talk with a discussion of the latest trends in Cambodian labour politics in light of China’s involvement in the country.